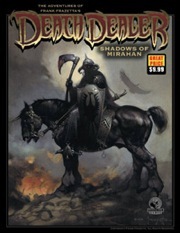 An epic adventure of dark fantasy, magic, and horror, Shadows of Mirahan brings the savage world of Frank Frazetta’s Death Dealer to life with setting details, rules variants like critical hit tables, and pre-generated characters. When the armies of good have all fallen, and the last citadel burns in the night, will your heroes have the courage to rise against the shadows of Mirahan? Neuroglyph Games: "It is a very well written and executed adventure, with stunning artwork, and a compelling storyline. The encounters and creatures are well-designed, and will provide plenty of challenge to D&D 4e players." Living Dice: "The bottom line: This is a must-have 4E product. If you can’t find someone to run this adventure for you, you need to run this for someone." Flames Rising: "If you’re 4th Edition Dungeons & Dragons group are fans of Frank Frazetta’s Death Dealer or of the Image Comics miniseries, then this adventure would probably be a good one-shot to play in between larger campaigns, especially at a $10 price point." Death Dealer is a creation of Frank Frazetta. All other characters and story created by Jay Fotos, Nat Jones, and Joshua Ortega. Goodman usually does offer PDFs of his products... I'm kind of surprised we haven't seen this one yet. The PDF won't be much cheaper the the printed product. I don't know where you live, but I checked and it would only cost USD 6.20 shipping to Ireland (where I live). That will be less than USD 15 for a 96 full colour adventure with pics. by Frank Franzetta. I don't play 4th but am seriously considering to order it, based on value of page/dollar alone. And I just noticed that you get the PDF for free when you buy the print product. Now it is a must buy for me. The PDF edition is now available.